I had a lot of warp yarn left on the loom after my friend finished her wrap, but not enough to make another scarf without making some adjustments. I decided to take the remaining warp off the loom and add more colours to it. I used fisherman’s knots to add in three new warp colours (navy, pink and cerise) from my stash to make a new warp. I put the coloured yarn in randomly thought I did check for patterns that might inadvertently creep in. Sett was 15epi. I chose a Lincraft yarn 100g, 100% wool $1 from the op shop for weft. It’s a pale green shade to calm the vivid warp colours. I like the colours of the warp in the fabric, but felt they were too riotous for a fringe. Instead I went for a hemmed finish using the Java tone of Bendigo three ply that is also in the warp. The finshed scarf will be a gift for an overseas friend. Taking inspiration from Textile Ranger who recently posted her first finish for 2014, here’s mine. 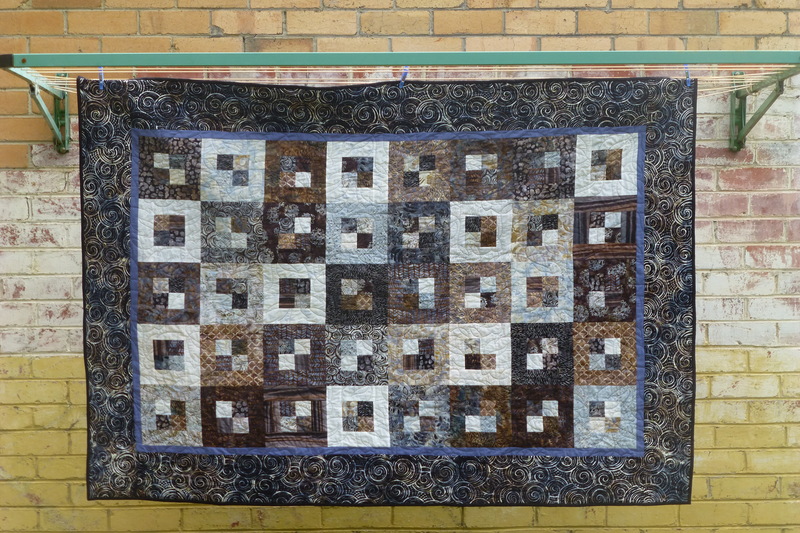 I just managed to get this log cabin quilt done (and posted here) within the first quarter of the calendar year. Doesn’t that sound like an office worker talking? This time the centre ‘hearths’ are a mellow orange colour and I chose a binding of a darker orange to continue that theme. The label still needs to be attached but other than that, I’m done. It’s the first quilt I’ve made where I haven’t pre-washed the batting and I’ll be interested to see how it responds to washing. But first, I plan to use it a bit. 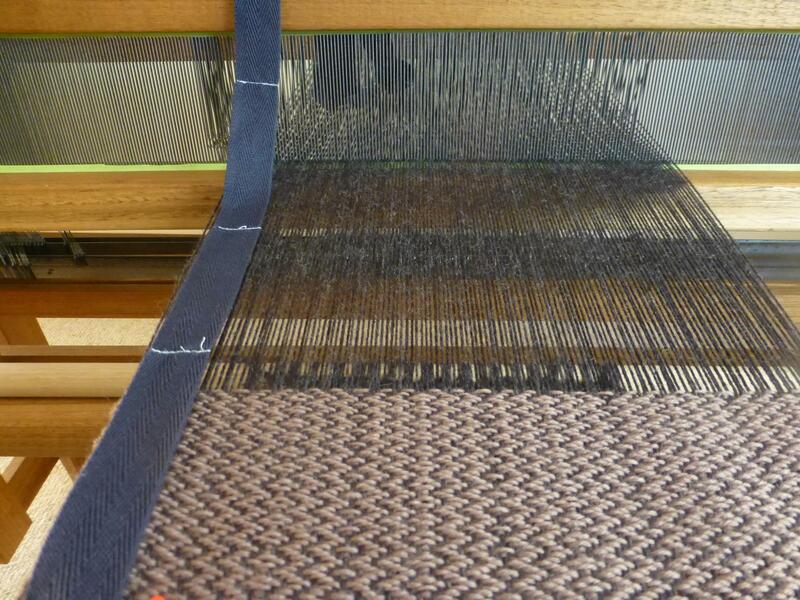 The charcoal warp that I put on my four shaft Druva floor loom measured 4.5 metres. After completing the pistachio chevron scarf I cut it off the loom so I could re-tension the warp, something that was sorely needed. I did my best to apply the lessons of the pistachio scarf to the cappuccino scarf, in particular maintaining an even and light beat, and keeping a close eye on the width of the weave. The effort paid off and I am much happier with this weaving. 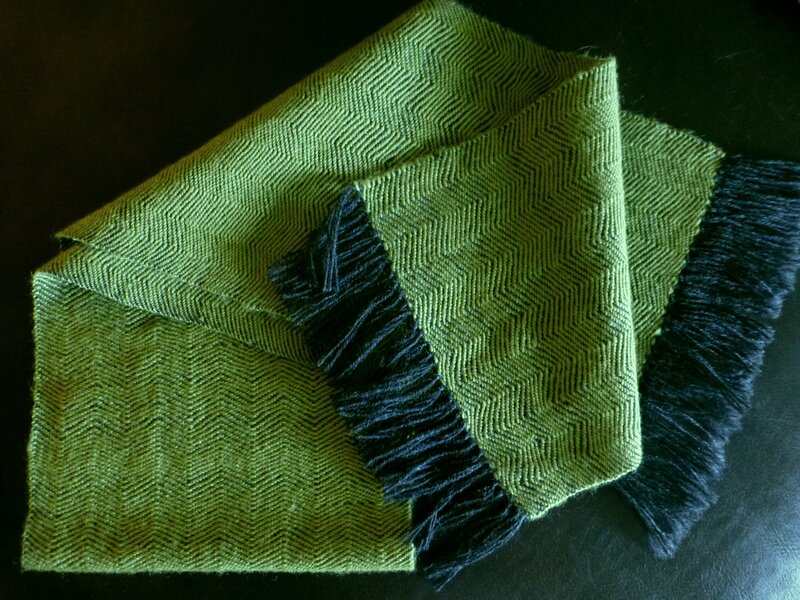 In addition to the technique changes, I did 8 picks of charcoal plain weave at the start and finish of the scarf, changed the pattern and used hemstitch in place of overhand knots for the fringe. 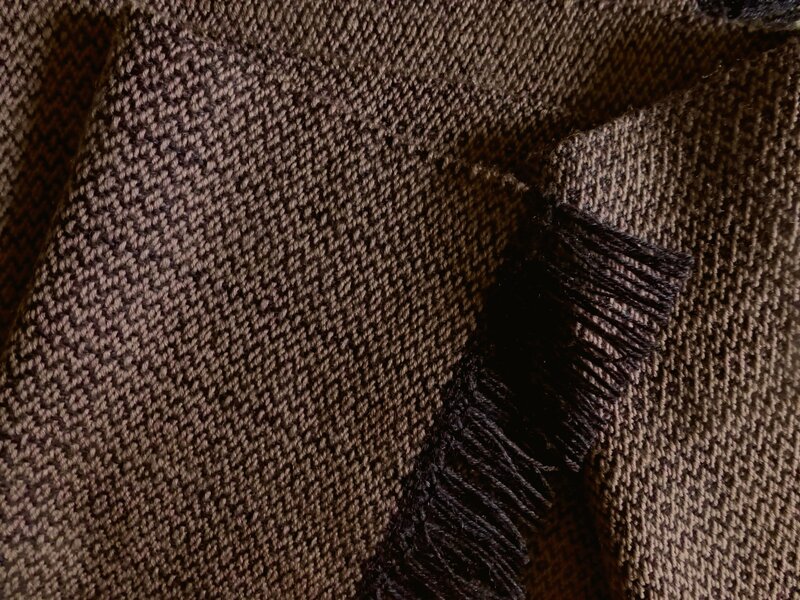 The cappuccino scarf measures 132cm by 23cm after wet finishing. That’s 52 inches by 9 1/4 inches for those of you who think in those terms. 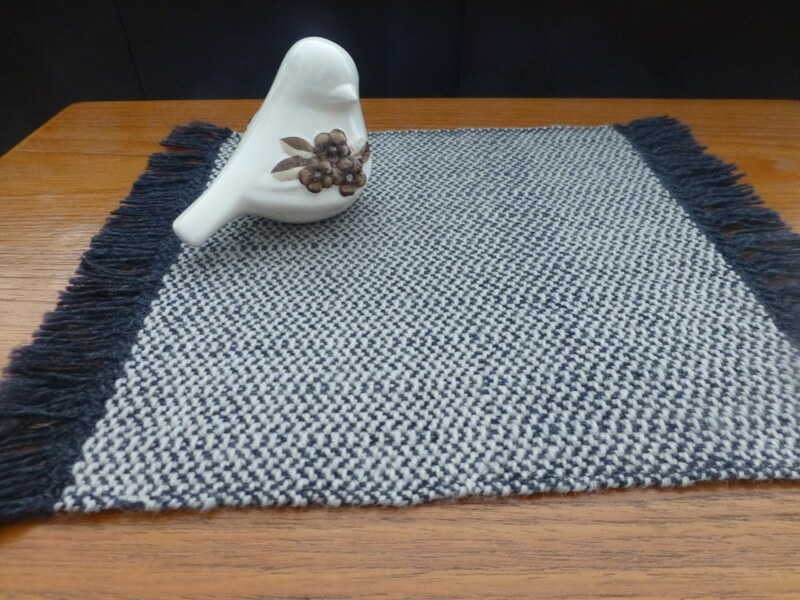 I had a bit of warp left after completing the cappuccino scarf so I had a play with pebble weave and made a little table runner. It’s a 9 1/2 inch square and I rather like it but calling it a runner seems a bit over the top for such a small item. Any suggestions? What would you describe it as? Some people are happy to follow the instructions and make beautiful things. Others need to know why. I’m firmly in the ‘tell me why’ camp. Maybe it’s down to unresolved issues from my childhood, maybe it’s down to a general distrust of authority and maybe I’m just a scientifically-minded gal. When my weaving teacher didn’t provide a whole lot of insight into the ‘why’ of wet finishing, I wanted to know more. 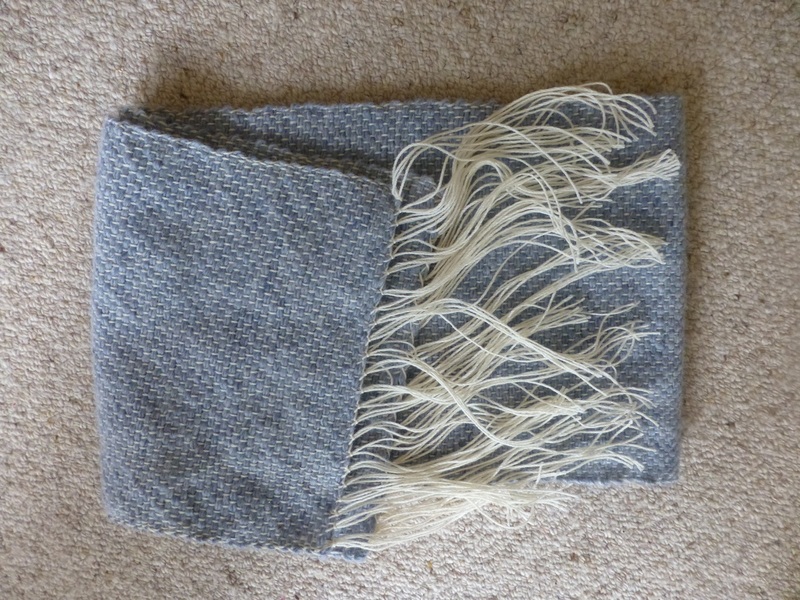 Now, thanks to the late Allen Fannin and his book Handloom Weaving Technology I know that the magical results achieved by wet finishing are all down to wool’s property of hydrothermoplasticity. In short, weaving introduces tension to fibre. Water and warmth relax that tension and cause the fibres of the weave to meld. – The weave can split of the warp tension is too tight. A light ‘bounce’ in the warp is enough, don’t tighten the warp further. 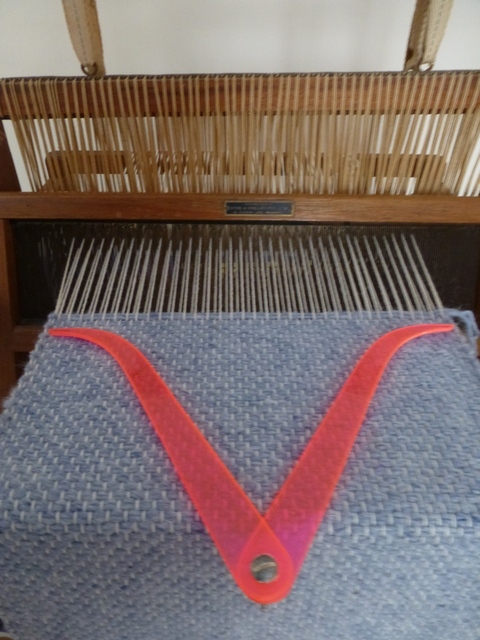 – Keep a vigilant eye on the width of the weave and measure it under tension. If the weaving width decreases as you weave, you risk a broken warp thread at the selvage. This happened on the chevron scarf but wasn’t a disaster as all the books tell you what to do to fix a broken warp thread. One day I’ll have a temple (stretcher) to help maintain the weaving width. – Be gentle with your beat. I am applying all these lessons to my current project, another scarf, using the same warp but a different treadling. The blue tape in the photo is my measurement guide. Each line of machine stitching marks 10cm. I move the pin each time I finish another 10 cm. The weave may turn out to be too loose this time as I’m using a very gentle beat. If it is, maybe the miracle of hydrothermoplasticity will fix it. I’m celebrating another finish and it’s a first for me. Pictured below is my first completely independently devised and executed weaving project. Finished, but before wet finishing and trimming the fringe. The warp and weft yarns were both acquired from the Handweavers and Spinners Guild sale, which I felt was a good way to get my hands on some inexpensive yarn for early experiments. I can’t be 100% sure the ball of weft yearn was complete when I bought it as it had clearly been knitted, unraveled and the ball rewound before it made its way into my hands. Half way through the scarf I was winding a shuttle and unearthed the label. I was delighted to learn it was Icelandic yarn, a brand called Álafoss Lopi, made in Reykjavik, Iceland. Their web site describes the colour as light denim heather. Assuming the ball was complete, the weft consumed 100 m. (109 yd.) of yarn, woven at two strands per pick (hope I’ve got the terminology right). Challenges along the way were managing the change over from one shuttle to the next and how to manage the weft joins/overlaps and how to keep the width of the piece even. I found an innovative and possibly unusual way to address the even width challenge by using my pottery calipers to monitor that the width was staying true. I didn’t do so well with the joins and tried the ‘overlap method’ (too bulky in the weave) and the ‘unravel, twist and spit method’ (fiddly and a bit yuck.) If you are an experienced weaver reading this, I would welcome your tips on starting and stopping elegantly. I’m happy with it but I see areas for improvement. It’s always part of my workflow on any project to step back and ‘live with’ the finished item for a while, leaving it in a place where my gaze will fall on it and where I will be prompted to reflect on what was done well and what could be done better. I redid the hem stitch at the start of the weave as I felt some of the stitches could have been more even but I remain less than 100% satisfied with the result. I need to work on my finishing techniques. The warp was a little unevenly distributed. I chose to blame the loom not the weaver. The Dyer & Philips table loom will soon have a new home thanks to eBay. Charming though it is, I decided to part with it to make room for my latest acquisition – a second hand four shaft table loom with movable wire heddles. Post and pix of my new acquisition coming soon. 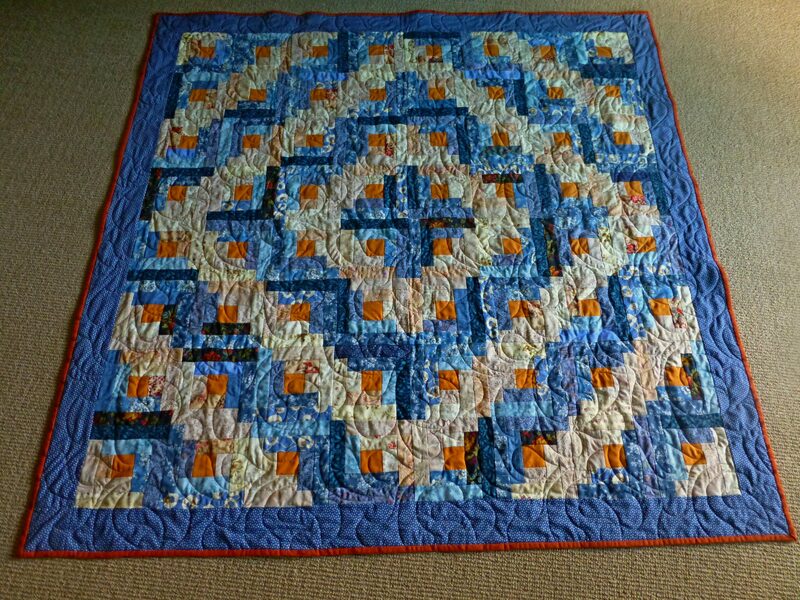 Started late in 2012 and painstakingly pieced and finally finished. The dimensions are roughly 110cm by 120cm. I wanted to quilt it myself about a quarter inch from each seam line but I realised that would require more time than I had available. 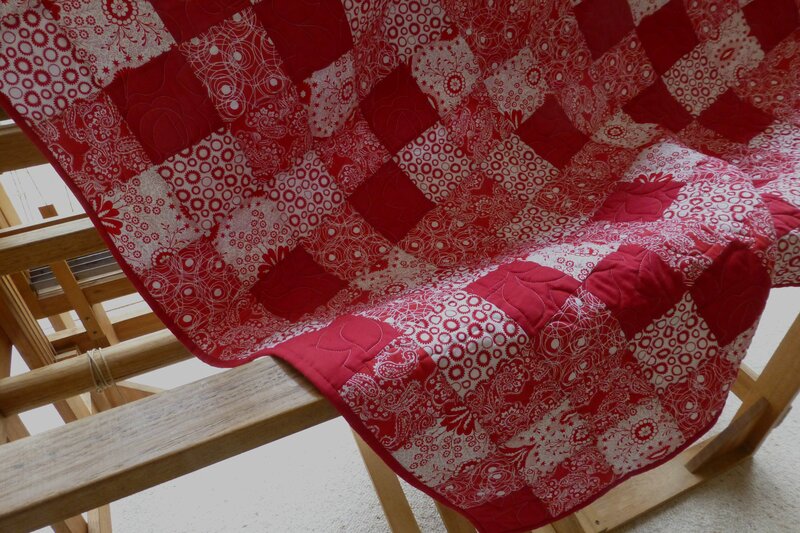 My professional quilter expressed a preference for an edge to edge design because it was easier for her to execute. I regret agreeing to that as I feel my design vision wasn’t delivered. 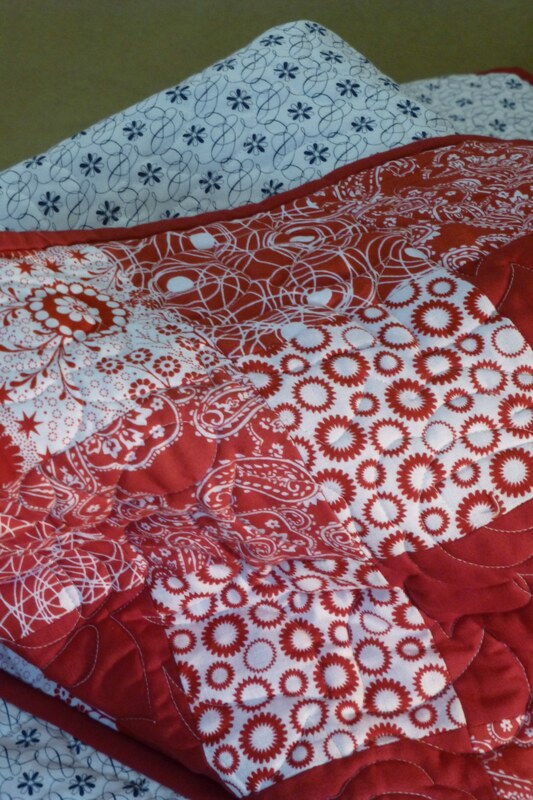 I like this quilt, but I don’t love it as much as I was hoping/planning to. 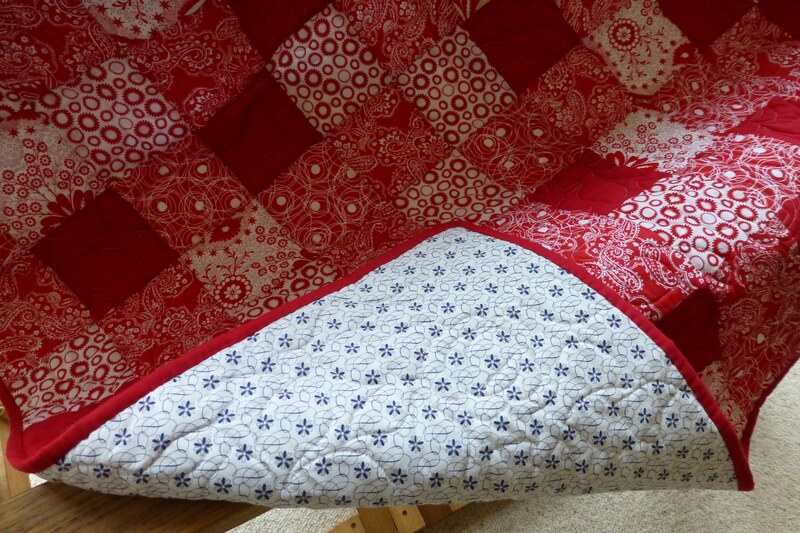 The batting is Quilters Dream Poly (throw sized) in mid loft which was quite inexpensive and can be quilted as far as 12 inches apart. It will withstand lots of washing and doesn’t require pre-washing but I find it little stiff. So far I have not found a polyester batting that drapes in the way I want it to, ie like cotton batting. I have a packet of low loft Quilters Dream Poly ready for a jelly roll quilt that is yet to be started and I’ll be interested to see how that compares. Note the quilt stand in this last photo. It’s my brand new (to me) Druva four shaft floor loom and it came home yesterday.